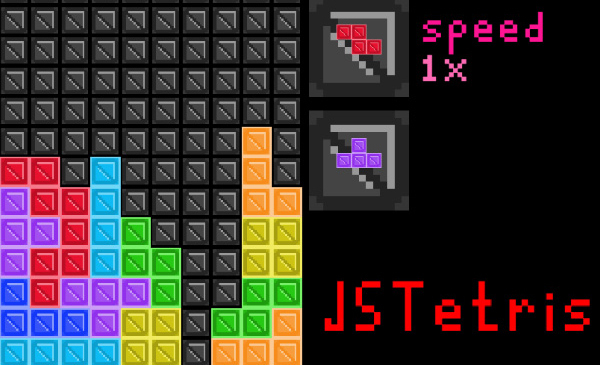 Let me share with you my latest addition to my gaming list projects, i have been playing a lot Puyo Puyo Tetris lately which is an awesome game for Nintendo Switch, i was thinking, hey!, i love this game so much, why not create a Tetris clone using HTML5 Canvas and ECMAScript 6 language?, so i started implementing the game a few days ago, i reused some classes from my previous game projects so the development was lighting fast. The music played in the game is from a group known as PowerGlove, if you have not heard of them, go ahead and look for this incredible group and listen some of their recordings. I do not know if i could be committing some copyright infraction here, but i am planning to record my own Tetris metal theme song on my electric guitar soon but meanwhile i am using the PowerGlove version for now, i hope there would be no problems. Regarding the mechanics of the game, each minute the speed of the game increments, you have to clear 10 lines to avoid the speed increase or if you clear 10 lines the speed reduces, therefore your mission is to clear as many lines as you can to prevent the game to end.